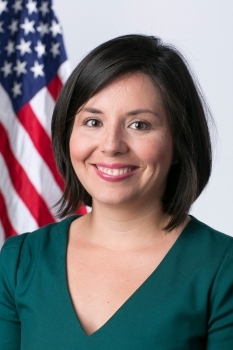 Stephanie Valencia began working as Deputy Chief of Staff to U.S. Secretary of Commerce Penny Pritzker in October 2013. In her role at the Commerce Department, she handles external engagement and collaborates on strategic planning efforts that support the Secretary’s priorities. Prior to joining the Commerce Department, Stephanie served in the White House Office of Public Engagement for nearly five years, most recently as Special Assistant to the President and Principal Deputy Director, where she oversaw critical engagement around some of the president’s top priorities, such as immigration. She started out in the office working on outreach to the Hispanic community and housing issues. Stephanie started her career in the nation’s capital as a Congressional Hispanic Caucus Institute Fellow for the U.S. Senate Democratic Steering and Outreach Committee, chaired by Senators Tom Dashcle (D-SD) and Hillary Clinton (D-NY). A graduate of Boston College, Stephanie was born and raised in New Mexico. She and her husband Oscar reside in North Bethesda, Maryland with their two dogs, Dug and Lucy.